Comments Off on Lakefield Hangs on to Defeat Port Hope! Lakefield Hangs on to Defeat Port Hope! Our Orr division Champions took a 3-0 series lead over the Port Hope Panthers but couldn’t close out the series as the Panthers came back to tie the series at 3-3 and force a game 7. The Chiefs opened up 3-0 lead and took it into the third when the never say die Tod division champions scored two late goals but could not get the equalizer. Congrats to both teams on an exciting series and good luck to the Chiefs as our Orr division representatives. 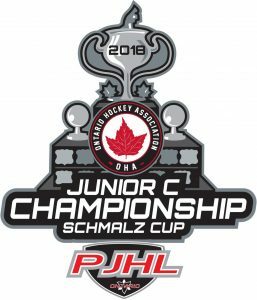 Lakefield will now play the Stayner Siskins in the Schmalz cup Semifinals, click on the logo to follow the road to the cup.